Copyright: © 2017 Vinoo D, et al. This is an open-access article distributed under the terms of the Creative Commons Attribution License, which permits unrestricted use, distribution, and reproduction in any medium, provided the original author and source are credited. Behavioral disturbances among patients with dementia, including agitation, aggression and psychosis form a constellation of symptoms referred to as behavioral and psychological symptoms of dementia (BPSD). These impact heavily on resident’s quality of life, caregiver stress and management options for the team. In the United States, CMS (Center for Medicaid and Medicare services) launched the National Partnership to Improve Dementia Care and established a goal of reducing the use of antipsychotic medications in long-stay nursing home residents by providing person centered comprehensive care. • Implement CMS regulatory standards to improve dementia care. • Improve the quality of care of residents with diagnosis of dementia by providing person centered memory care programs. • Reduce falls and physical altercations by providing music and memory. • Reduce the usage of antipsychotics in dementia related behavior (BPSD) by implementing music and memory. • In US 5 million people have Alzheimer’s disease. • 2 million people with Alzheimer’s disease live in a Nursing home in USA. • Over 60% of Nursing home residents with dementia present with behavioral and psychological symptoms of dementia (BPSD). • 75% of people with dementia will spend time in nursing home, most typically in the moderate to advance stages. Not FDA approved. Antipsychotic use in the US peaked in 1990’s to a high of 1 in 3 dementia residents were receiving an antipsychotic. Despite a federal “black box warning” starting 2006 regarding risks, the antipsychotic usage in Dementia remained high. In last quarter of 2011; 24%, percent of long stay nursing home residents were receiving an antipsychotic medication. In last quarter of 2016, 16% percent of long stay nursing home residents were receiving an antipsychotic medication. • F-329: Drug regimen is free from unnecessary drugs; Residents on Antipsychotic receive gradual dose reduction and behavior intervention unless clinically contra indicated, in an effort to discontinue these drugs. • F-248: Activities; the facility must provide ongoing activities and services to maintain highest physical, mental and psychosocial wellbeing of the residents. • F-309 Quality of care; the facility must provide care and services to attain or maintain highest physical, mental and psychosocial well-being. Using Lean Methodology, a “Memory Care” Project team came together in October 2014 to review current dementia care practices. Identified the gaps and created a structured Memory Care Program. This program impacted 108 residents in the NYC Health + Hospitals/ Coler. This study was conducted in four Memory care units with 108 residents at an 815-bed long-term nursing care facility. All residents in Memory Care Units from last quarter of 2014 to last quarter of 2016 were individually assessed for, usage of music and memory, usage of antipsychotics, physical altercations and falls. Consistent staffing; Consistent assignment is an extremely important component of good care. In Coler, Memory care units have consistent trained Interdisciplinary staff. Newly created Memory Care “Neighborhood” has a Coordinator to integrate the services, all interdisciplinary staff work in the memory care units report to the memory care coordinator on daily basis. We also modified Job Functions of interdisciplinary staff and cross trained them to improve meaningful engagement, every departmental staff engage the residents in different activities, for example. Housekeeping staff have story telling sessions to the residents, Therapeutic Recreation staff set up the meal trays for residents, nursing staff do musical performances and dancing programs with residents, administrative staff play games with them [1,2]. Consistent huddle with interdisciplinary staff, in the units interdisciplinary staff have consistent huddles of all tours, in the huddle team discuss about any changes in residents medical conditions, cognitive functions, ADL status, changes in behavior, etc. This discussion with the interdisciplinary staff help the team to develop person centered I care plans. Music and Memory Program around the clock; is the personalized music (iPod) project in the Memory Care Units. Music that is personally meaningful to residents has been found to evoke past memories, often helping the resident to feel calmer and more connected to other residents, staff, family and friends. Liberalized Diet; Even when people with Dementia can’t remember the name of the food, If they like the food, they are much more likely to eat it. As per Academy of Nutrition and Dietetics “the quality of life and nutritional status of older residents in long tram care facilities can be enhanced by a liberalized diet.” In the Memory Care Units of Coler, 90% of the residents are on liberalized Diet. Snack on Demand; the units have a snack cart around the clock with different types of snacks, juice, ice cream jello and more. The key element for residents with Dementia is for staff to offer individually preferred snacks directly to residents approximately every hour around the clock while awake. Because people with Dementia slowly lose the ability to initiate or tell someone if they are hungry. Developed I-Glance and I-Care Plan as a resident-centered communication tool; this is about residents preferences, likes and strengths. I Glances are posted at bedside of the residents. When the residents are being transferred to acute hospitals, the unit team sends copies of I Glance and I Care Plan to the facility as communication tools. Training of the staff; 90% of Interdisciplinary staff is Certified Dementia Practitioners by NCCDP (National Council for Certified Dementia Practitioners). Memory Care Co-coordinator provides ongoing structured standardized in vivo training. Meaningful Engagement; Distress may result when people are feeling lonely, bored or frustrated. When caring for people with Dementia, every interaction has the potential for meaning. Whether it is offering a snack or walk hand-in-hand. There is connection and potential for comfort. All staff regardless of disciplines has a crucial role in meaningful engagement of residents [3,4]. Meaningful activities for short duration and multiple activities in different stations by interdisciplinary staff; Activities must be customized to be meaningful. The residents with Dementia almost never engage in large group events. There are many options available and staffs are familiar with what will work with a given resident on a given day. Bathing without Battle; almost all residents with Dementia are resistant to take shower. Our team has created pleasant bathing experience and reducing the battle by providing person centered bath such as, No rinse bathing, singing bath, Recliner bath, Music in the shower room etc. Figures 1-4 shows the percentage of residents in various programs. 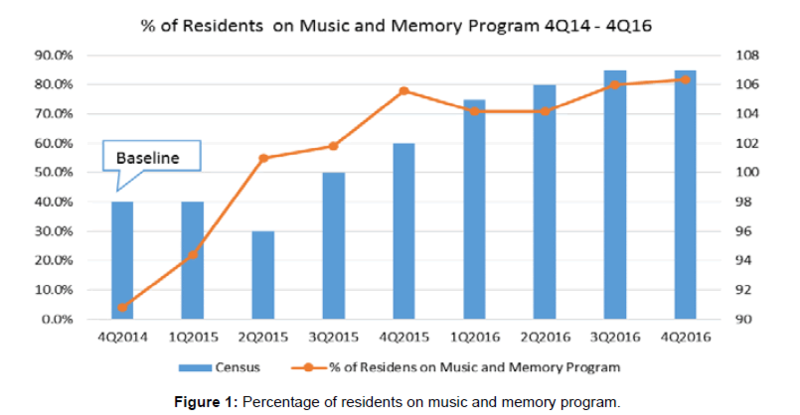 Figure 1: Percentage of residents on music and memory program. 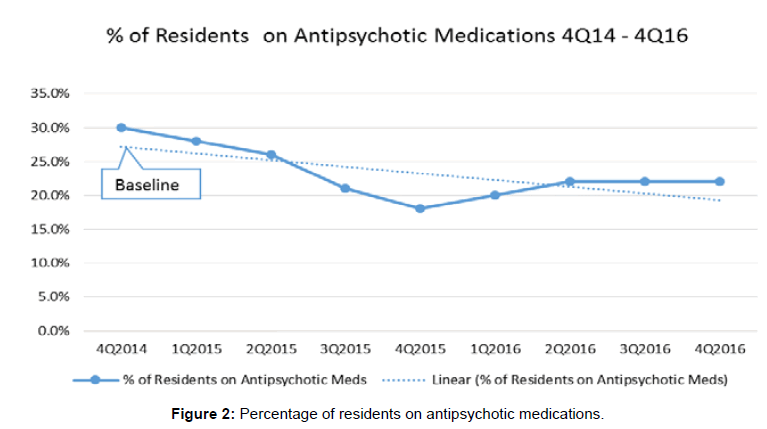 Figure 2: Percentage of residents on antipsychotic medications. 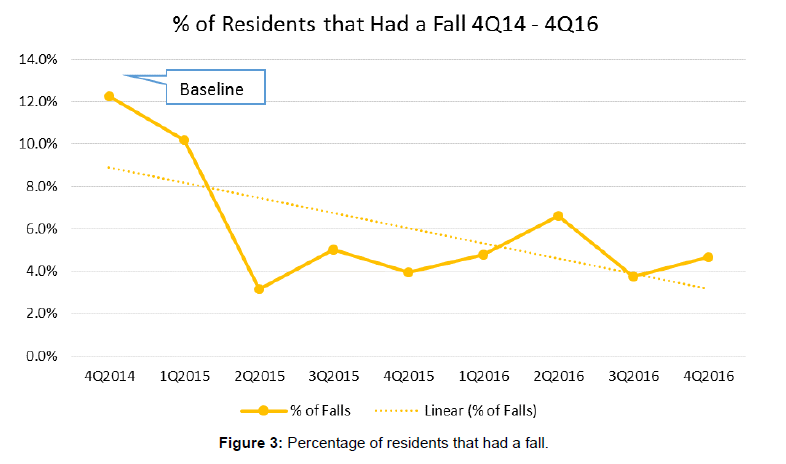 Figure 3: Percentage of residents that had a fall. 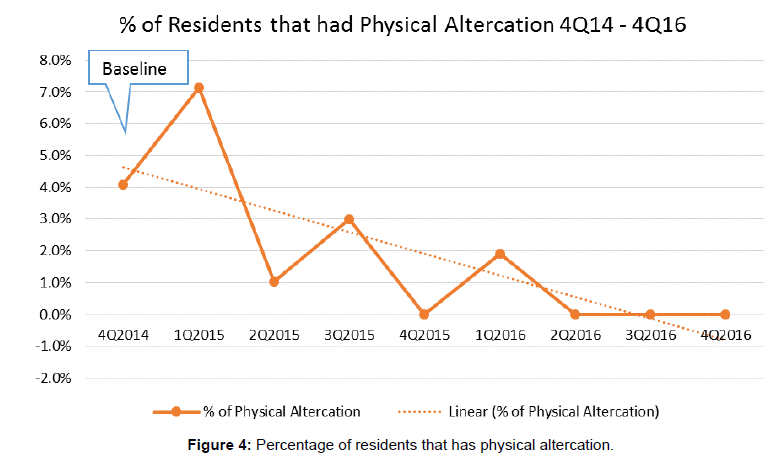 Figure 4: Percentage of residents that has physical altercation. Remington R (2002) Calming music and hand massage with agitated. Nurs Res 51: 317-323. American Society of Consultant Pharmacists (2013) Antipsychotic medication use in nursing facility residents. Bharucha AJ, Rosen J, Mulsant BH, Pollock BG (2002) Assessment of behavioral and psychological symptoms of dementia. Prim Psychiatry 797-802. Cohen-Mansfield J (2001) Non-pharmacological interventions for inappropriate behaviors in dementia. Am J Geriat Psychiatry 9: 361-381.